Situated in the heart of the Eastern Cape Garden Route, and lying between the Tsitsikamma Mountains and the Indian Ocean, the Eastern Cape, Storms River / Tsitsikamma area is often described as a wonderland because of its beauty, where visitors are spellbound by the dramatic Eastern Cape coastal scenery - rolling seas with massive, wild breakers pounding the shore; magnificent rivers winding their way from the Eastern Cape plateau down to the Indian Ocean; lofty mountains, sheer cliffs, and lush forests covered with a carpet of delicate fynbos. The ancient, indigenous Eastern Cape, Storms River / Tsitsikamma forests are home to the giant Outeniqua Yellowwood trees - some over a 1,000 years old, as well as Stinkwood trees and many more that tower above one another to create a paradise of greenery, with the underlying fynbos bringing gorgeous colour to the Storms River / Tsitsikamma Forest, making for a spectacular sight. The Eastern Cape, Tsitsikamma Forest is a protected conservation area with gorges, icy pools and beautiful waterfalls, with most of this rich utopia part of two Eastern Cape National Parks - the Tsitsikamma Coastal National Park, and the Tsitsikamma Forest National Park. 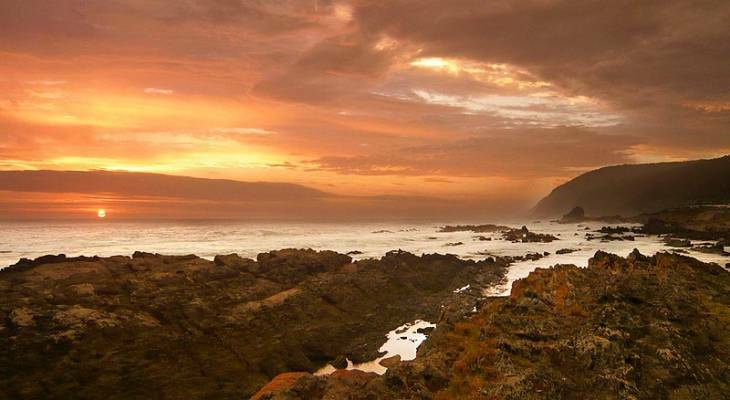 The Tsitsikamma Coastal National Park stretches across some 75km of Eastern Cape coastline, and with its mild climate all year round, the Storms River / Tsitsikamma region is the ideal destination for adventurers who come to hike the rugged coastline. Renowned as one of the best hiking trails in the world, the rigorous Tsitsikamma Dolphin Trail is not for the faint hearted. Those with the stamina and courage will be rewarded with breathtaking views of the rugged Eastern Cape, Storms River / Tsitsikamma coastline, which is often the playground for whales, dolphins and otters, and there is the chance of seeing the rare Oyster Catcher, and the Cape Clawless Otter. On the Tsitsikamma / Storms River Aasvoelkrans Trail, you will see ancient stone fish traps which date back over 5000 years. By using rocks, the Khoisan people created artificial tidal pools which catch fish stranded by the ebbing tide. En-route through the Eastern Cape, Tsitsikamma National Park, many species of birds can be seen and heard - watch for the Amethyst Sunbird along the Tsitsikamma Forest edges, and the Rednecked Spurfowl in the thickets. Resident game in the Tsitsikamma Forest / Storms River includes an abundance of bushbuck, steenbok, aardvark, rock hyrax, monkeys, porcupine, bush-pig, caracal lynx and large-spotted genet. The Eastern Cape, Storms River / Tsitsikamma area is a photographers', hikers' and water sports paradise, with lots of adventurers on offer. For the adrenalin junkie, bungy jump off the world's highest commercial bungee jump (216m); take a Tsitsikamma canopy tour, where you'll experience an unforgettable adventure as you slide from one platform to the next along a series of steel cables set through the indigenous Eastern Cape rain forest; on the Tsitsikamma Falls Zipslide, enjoy a birds eye view of 3 waterfalls as you zipline back and forth across the Kruis River, then try Abseiling Tsitsikamma in the wonderful surroundings of the beautiful Tsitsikamma, where you'll rappel 36 meters down a fairy-tail like fern cove to the bottom of a waterfall. For the not so adventurous, there are exciting and interesting Eastern Cape hiking trails through the beautiful Tsitsikamma Forest. For the water-lover, snorkelling or diving is where you can expect to see fish, sea urchins, sponges, anemones and sharks in one of the best diving spots in the world. For something completely different, the Eastern Cape, Tsitsikamma Wolf Sanctuary is the only registered, non-profit centre in South Africa housing these magnificent creatures, and it's here where you can observe the wolves in large enclosures, known as 'dens', similar to their natural habitat. This Eastern Cape wolf sanctuary is a rehabilitation centre and refuge for a range of grey wolves, including the Canadian Timber Wolf, who have been abused and discarded as unwanted pets. Because of the belief that the wolf was the very first healer, many healers and therapists flock to the Eastern Cape Tsitsikamma Wolf Sanctuary to commune with these magical animals. This Eastern Cape wolf sanctuary is situated 10.5 km from the Storms River bridge towards Port Elizabeth, in the Eastern Cape, Tsitsikamma region. For the golf lover, the Fynbos Golf Club is only 4 minutes from Eersterivierstrand. (46 minutes, 45.6km via N2 from Storms River). This Eastern Cape golf course is characterized by well-defined tee boxes, tiered landing areas, and bunkers protecting spacious greens. On site you will find a beauty salon, hairdresser and a restaurant. Away from the golf course, Eersterivierstrand offers pristine unspoilt beaches where you can enjoy swimming, fishing, snorkelling, scuba diving or just relaxing on the beach. Storms River / Tsitsikamma overview. Storms River / Tsitsikamma Accommodation and Information.